As we had feared (and were actually preparing to write), it looks like HP’s not going to have any TouchPads to sell through normal outlets like Best Buy, Amazon, and even their own website. Many of you have received TouchPads for previously unfulfilled backorders from HP’s Small and Medium Business Store and Amazon associate OnSale. The TouchPad’s also been sold through HP’s private Employee Purchase Program store and was available for a day on DailySteals. There’s one last channel of availability, and that’s Best Buy. But you won’t be able to just walk into Best Buy and grab a 32GB TouchPad for $149.99 (it seems the 32GB model was the only one that HP produced more of). No, you’ll have to by an HP PC (laptops, desktops, and all-in-ones all count) to get the TouchPad at the reduced price. In fact, that’s the only way to get a TouchPad from Best Buy. If you want to buy one and then return your computer, they’ll deduct from the return to match the original retail price of the TouchPad: $599.99. Best Buy is it for new TouchPads. 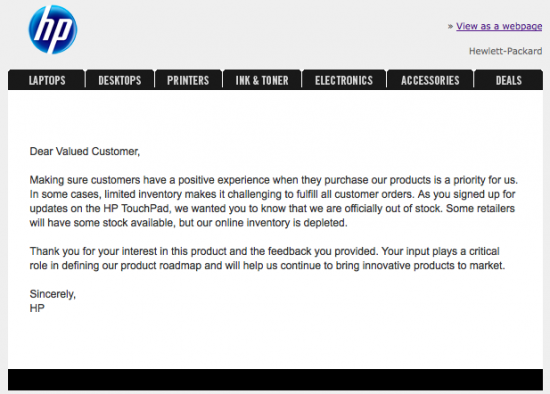 HP just sent an email to customers regarding the TouchPad, announcing that they are “officially out of stock.” So that’s it folks, unless you want to buy an HP computer from Best Buy, you’re going to have to look hard (or go second hand on eBay) to find a TouchPad. Source: HP, Best Buy; Thanks to everybody for the tips!